The story began in Pilgrim’s Rest in the late 1980’s where Dave and Rhoda met up with Christo Germishuis at the Poniekrans Stables. They started “Valley of Gold Horse Trails”, and would take groups of people through to ride Christo’s Horses and enjoy a weekend of sunshine and fresh air. After a short break due to other commitments, Dave and Rhoda were approached by Lakenvlei Forest Lodge to run Horse Trails at the lodge to suit guests requirements, and so Lakenvlei Horse Trails was born. After two years the Curtis’s moved to Elandskloof Trout Farm which had the added draw of being able to offer rides through the owner’s small game section. Unfortunately the farm was slightly out of the way, with access being down a long dirt road. Prospective clients would frequently find themselves lost or stuck in the mud! 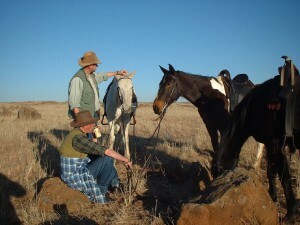 A move had to be made and Dave and Rhoda had found a new home for their horses at the Owl & Oak. This well-traveled herd took the move in their mannorly stride(s), however as they have been hand-picked for their even temperaments, this is probaply not that surprising. The centre can now be found at Walkersons, some 11 kilometres towards Lydenburg from Dullstroom. Dams, forests and verdant rolling hills make for wonderfully varied terrain and rides are made all the more enjoyable by that element of surprise.